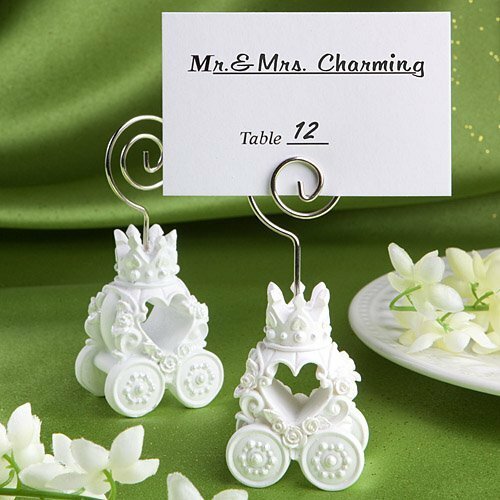 Give your guests a little piece of happily ever after with our royal place card holders! Each carved white poly resin base has the shape of an elegant carriage with heart cutout through the center and regal crown top embellished with sparkling rhinestones. The 3 1/4" by 1 1/4" place card holders include a sturdy silver coiled wire that extends up to hold a special photo after your event. Arriving with a set of blank place cards, these holders are bulk packed in poly bags. My order (190110-1065 was cancelled because delivery could not be before our Event on June 15, 2019; however, do you have the Royal Coach Design Plate Card Holders in stock? Yes, the Royal Coach Design Place Card Holder is in stock. What are the dimensions of the Royal Coach Design Place Card Holders? The Royal Coach Design Place Card Holders measure 3 1/4" by 1 1/4".